The peat-coloured river is low on this hot, bright day in July. We meet John on Barden Bridge near Skipton, North Yorkshire. After a welcoming handshake, he threads his floating DT6 fly line through the rings of his 9ft (2.7m) Powell fly rod. Determined to meet the challenge of the Wharfe, he sets off for the river. You’ll sometimes find trout in the most unexpected places,’ John points out. Though the water isn’t too deep, he fishes his way to the opposite bank. 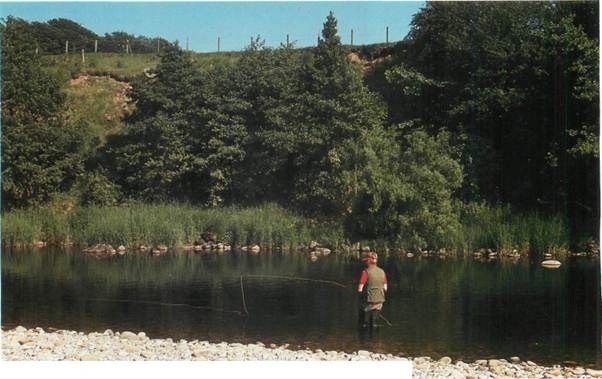 A day ticket allows you to fish five miles along both banks of the River Wharfe – from Barden Bridge to just past Bolton Bridge. 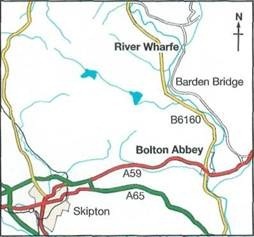 You can obtain more information about day tickets and restrictions from the Estate Office, Bolton Abbey, Skipton, North Yorkshire BD23 6EX (tel. 0756 710227). By car From Skipton take the A59 east until you see the B6160. Turn left, and drive up the B6160 for about one mile or so. Look for the Estate Office where you can buy your day ticket. The office also sells flies – should you need any extras. 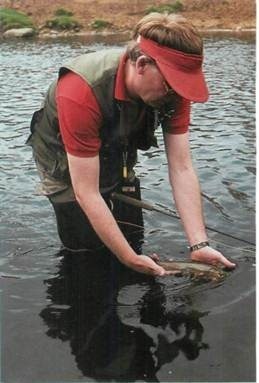 A preliminary investigation of the bottom of rocks helps to establish what the trout may be feeding on. John found the upside-down home of two leeches and a caddis larva. A stone-clinging nymph (not shown) scurried to safety. 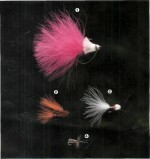 A size 16 Klinkhamer Special (top fly) and John’s size 18 Parachute Olive. In the box is a selection of his nymphs for the Wharfe. After fishing a pool for 20 minutes, John would ‘rest the river’, not to mention his arm. 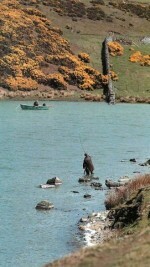 Any unusual activity may put trout off, causing them to stop feeding. Resting a pool allows it to return to normal. In a disturbed area, there’s then some hope the trout will soon start feeding again. John feels strongly about catch-and-release; it preserves stocks of wild trout which angling pressure would soon wipe out. The 1lb (0.45kg) brownie . Hold the fish in the water to revive it; otherwise the exhausted trout often tumbles headlong and in fast water can smash into rocks. A beautiful 1lb (0.45kg) River Wharfe brown trout comes to the net. It’s unhooked and then safely returned to the river in a moment. 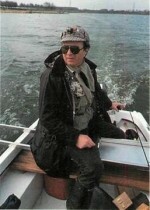 The continuous heat and blinding light intensity made fishing difficult. There are no guarantees when it comes to catching trout on the River Wharfe. The trout are elusive and can be very fussy feeders. Your best chances, however, are usually during an evening hatch. The first take of the day. Sometimes trout aren’t hooked solidly when using very small flies, so you need to be patient when playing the fish -just in case it’s lip-hooked. A swoop of the net along the bottom revealed this dark resident – a bullhead. Despite its modest appearance, nymphs tremble at the sight of this voracious predator. Off the eroded bank the river is moderately deep and fast flowing. John connects with a trout on the Klinkhamer Special; its high visibility and good floating qualities make it an excellent pattern for fishing in uneven water. John checks the surface for rises. The river bends slightly, forming a deep seething pool where the current sweeps along the steeply shelved opposite bank. Overhanging ash and beech trees provide ample shade, and a few trout betray their presence by rising. It’s difficult to tell just what they’re taking -probably small upwinged olives. The nearside bank is gravel and stones. Myriad small stone-clinging nymphs bask in the warm, shallow water. It’s as if they know that they’re safe in the bright conditions. Brown trout usually don’t venture into the shallows to feast on the copious stone-side residents until after dusk. John attaches a size 18 home-tied Parachute Olive dry fly and works his way upstream. His fly is taken, but the fish spits it out before he can blink. There’s a good sign – a trout is making regular rises. On goes the Klinkhamer Special, a dry fly on which John has caught over 300 fish in the past two years. Though you’re distanced from the trout when fishing with long drifts, John feels that controlling the line and fly are much more important. This is critical on northern rivers. Using a short drift aids presentation and accuracy. 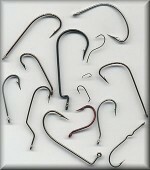 The probability of setting the hook effectively is also greater. It follows that hooking can be quicker but there’s always the danger of striking too hard at very short range and breaking the tippet. The high-visibility Klinkhamer Special soon proves its reputation: John gets a take. The trout wastes no time in bolting off to a swift-moving channel of water where, with the help of the extra force of water, it manages to tear free. John keeps an attentive eye for rises, surveys the river’s depth and looks for possible fish-holding features. Opposite some small entangled willows the current forges a deep channel. When a stretch is lined with underwater boulders, the river’s flow isn’t smooth and constant. The water seethes and churns as it is deflected against the large hidden obstructions, offering trout comfortable lies out of the force of the current. John spots three separate rises near the opposite shore in a relatively short time. He again selects the Klinkhamer Special for its floating abilities in this uneven, broken water and for its long curved hook which just might help to hook shy-biting trout. Most attractive lies, however, have their disadvantages. To get the fly to drift without drag isn’t easy amid all this bubbling water. John approaches the bottom of the pool from across instead of the usual up and across. He uses a reach cast to put a large upstream belly into the line. The fly drifts as naturally as possible across the lie. A little trout shoots up and nails the fly. To cover a lie in the pool which is obstructed by branches, John moves 8m (25ft) upstream of the willows. He fishes the dry fly downstream. 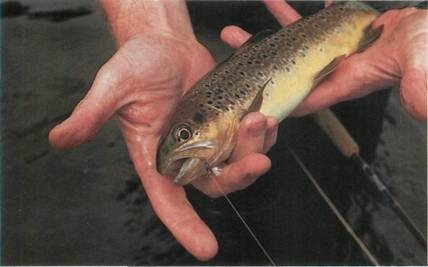 It floats perfectly over a rise, and a trout readily accepts the fly. John lifts the rod, but his leader breaks at the knot. 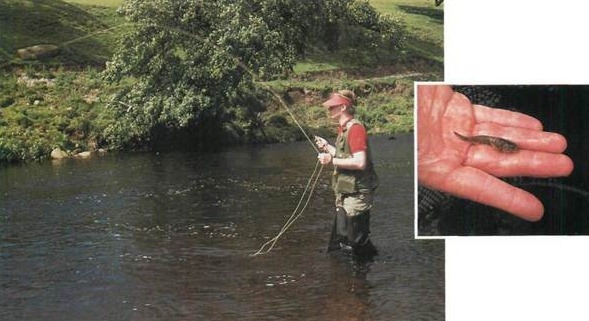 Truly, it’s one of the great angling mysteries – how the successful hooking, playing and landing of a trout can utterly silence these nagging questions. Needless to say, John happily returns a 30cm (12in) wild brown trout, and we break for lunch. Welcome to Florida…er…Yorkshire. The sun continues its relentless punishment — though you wouldn’t have thought so looking at the people walking along the river, sunning themselves or swimming. A large tan dog looks defiantly at John and then runs through his intended fishing area. It looks too big to quarrel with, so we decide to move as far away as possible from the Abbey and all the tourists and holiday makers – in search of peace, solitude and trout. Half a mile upstream of Bolton Bridge on the A59 a number of rises give an air of hope. From their tiny rises John reckons that they’re small trout – under 10cm (4in). There may be a large one among the local residents, though. It’s worth a try. 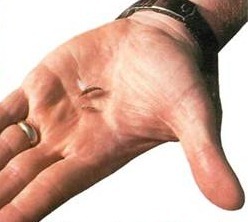 John attaches a small nymph and uses a tuck cast to present it. This cast speeds the nymph’s entry into the water and creates slack line. But nothing happens. He then puts on a size 22 Parachute Olive dry fly. There are plenty of swirls but no solid takes. Little tiddler-time wasters. That’s what these fish are. Every river has ‘em – little tiddler-time wasters, all four inches of them. They shoal up and rise like fury as they see you coming a mile away. Stew-pond excitement grips you. Consequently, you spend a lifetime here – all in vain, though. It’s torture-the-angler time and time again. These small, wary trout love it and have a lot of practice at it. John attaches a leaded nymph and decides to go for trout or grayling that mean business. The wisdom is in knowing when to quit! You have been warned. 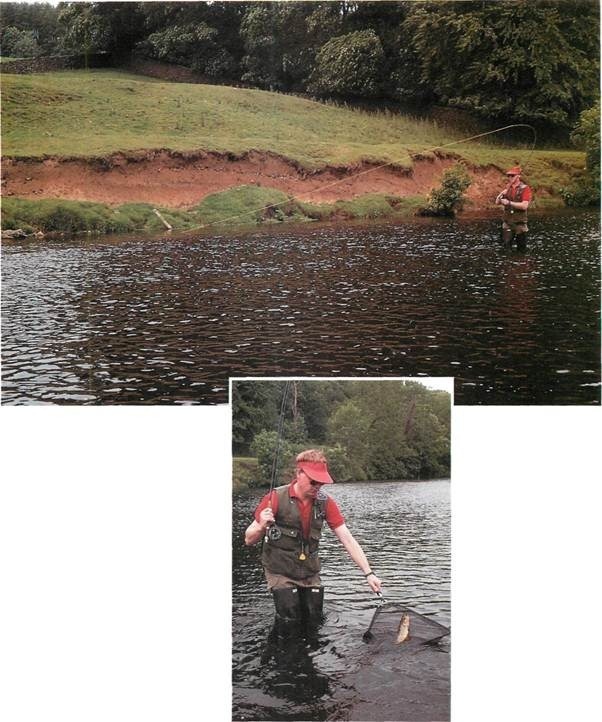 In weedless freestone rivers over 90cm (3ft) deep John maintains that there is always one zone of activity — the bottom. You might find nymphs making preliminary journeys to the surface in anticipation of more favourable conditions. But until a hatch occurs, you won’t find much activity at the surface, and you certainly won’t find much activity in mid water, the dead zone. The bottom is where the nymphs are, and the bottom is therefore where the trout are. Near Bolton Bridge the roar of the traffic reminds us it’s getting to be that time of day. The heat shows every sign of continuing into the evening; the hatches do not. 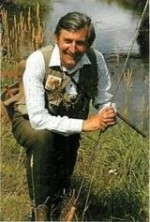 After nine long hours of working his flies both upstream and downstream, John decides to call it a day. With the baking July conditions, it’s been frustrating – but at least one trout did come John’s way.